Back in. We were to devise our second solo performance. This time we had 25 minutes to explore, but the performance was to be kept to 3 minutes. We were to use only our body (so no speech), we were to make a problem about the limits/ border of the space/ or the cavity, the whole, the emptiness. We were to use either the entire room or smaller, more specific space, even if it was just the palm of your hand…… we need to make sure that the borders were defined, clear. Think of a performance construct – a beginning, a middle and end, there is a start and end that is clear so that the audience knows. 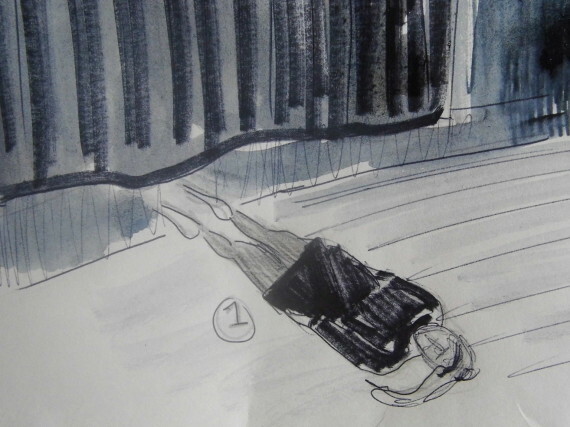 I think for our Group #2 performance, I had explored a small space within the centre of the room – on the floor. Although it was made from one continuous sheet of rubber, there were marks, slight grooves that gave the hint of small rectangles within its large expanse. I chose one of these to devise my piece within. I was intrigued by the limitations that a roughly 6ft by 4ft space would provide me. I was also interested in pace; throughout the day I had been operating at moderate speed, moving within a couple of low gears, and wanted to push the notion of fast movement within a small constricted space. I had recently performed a pilot of a performance art piece (which I had devised) called ‘Light Kills Darkness, Here I Am’ that examines the theme of mortality. 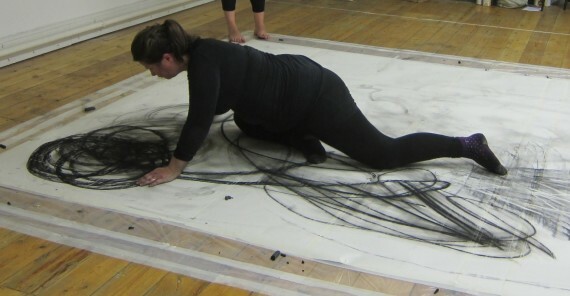 I wanted to draw on this and test how I could potentially apply the days learning to it (for this piece I am live drawing within a restricted space – only a bit larger than the one I was currently contemplating). Lying down within the rectangle conjured up the feeling of a warm protective womb. But there were converse sensations; these physical boundaries, these enforced restrictions reminded me of a prison cell. The metaphor of life (with its own restrictions and limitations, whether fiscally, mentally or emotionally) came to mind and although this is a much explored subject, I thought a performance about a life cycle, within the constraints of limited space and time would be interesting to devise. After writing a basic score, I proceeded to rehearse. I now had twenty minutes. Time went very quickly. I found that manoeuvring my body within a small space was quite tiring, I had to push and pull it, squeeze and roll it. I had to stop and start, go fast then slow; as if on some intense army fitness regime. I wanted every movement to have a purpose, so that it imbued meaning. I didn’t want it to look careless or scrappy. I wanted the smallest and slowest of movements to be just as impactful as the large and the fast. I found that I needed to quickly edit the content. We were going to be timed and an alarm would go off after three minutes had passed. This wouldn’t be an instruction to stop but a suggestion that we should create an ending at some point close that sound being heard. It was time for our performances. We voted to organically decide when we would perform, choosing a point when our performance would naturally sit alongside or challenge against another. Danger, quite scary to watch, graceful, visually stunning. Shapes within a space. Folded, screwed, flat, high. How do we look at those? Audience to change perspective? Up to the audience. Nature of space changes as to viewpoint. Performer stays still amongst the audience. The paper is the performer. Around the room, with a finger. Following an exact line. Across each surface. Around the architectural details. Tracing a line up a beam. Very carefully. Slowly, purposeful. Then again behind it. Discovers that it moves. Discovers can lift up from it. Can balance from it. The audience during this performance were perfectly placed for me to be able to move them subtly to where I would like them to be for mine. I readied myself. The performer silently indicated that she had finished. I made a distinct movement and indicated to the audience where I wanted them to stand (or sit, I didn’t mind which). I wanted them nearer to me this time (compared to my first performance when they were distant); I wanted it both to be intimate and provocative. I climbed into the womb. I had taken care during my rehearsal not to ever go over the edge. I had measured my body to make sure that I could twist, turn, rise and drop without breaking through the boundary. I explored the space as a foetus. I was blind, I couldn’t see. I explored through my fingertips, next my elbows. I wriggled and squirmed until I was free. I opened my eyes. I lay still. Then I kicked and lifted my head, I rolled over and shuffled along. I got onto my knees and crawled, investigating the confines of my play pen. I stood up, I wobbled, I walked, and I jogged. I ran around and around and around and around, ever faster. Then fell to my knees. I paused. I stood up and changed direction. I tentatively jogged. I slowed to a stooped walk, then stooped further down until I was laying on the floor. I reached out, exploring my environment with my fingertips, then stopped. I lay there, breathing heavily. Not wanting the noise of my breath to detract. My heart was racing. I stood up and although we had been asked to not verbally indicate the ending of the performance, I uttered an ‘ok’. I was physically exhausted and needed to calm my heart rate down. The ‘ok’ was to myself as a confirmation that I had got through it – without collapsing. I had felt dizzy and disorientated, but vehemently determined to keep going. Questioning the audience. Interacting through facial expression. Exploring the surface of something. Pushing it. Testing it. Sharing their inquisitiveness. 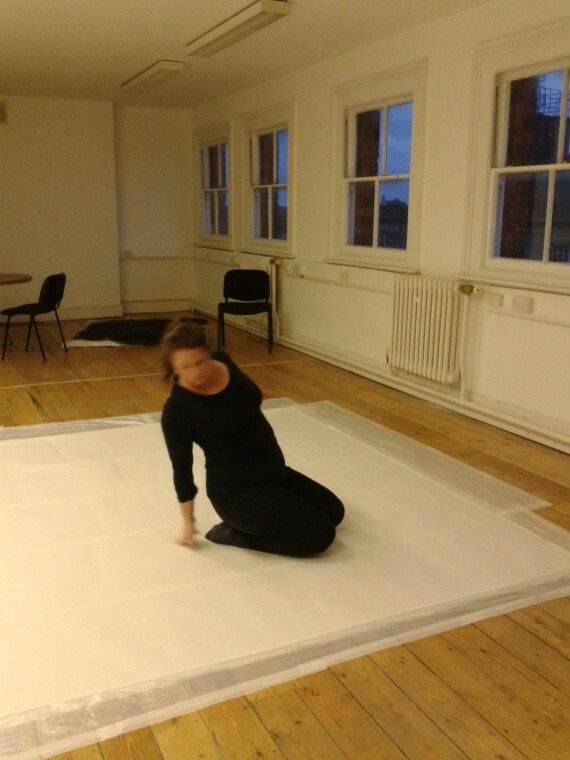 Preparation of a space within a performance. Acrobatic. Agile. How to manoeuvre. Outside and inside something. Can’t see, but we know what she is trying to do. Different ways to use a table and chair. Crawl, on top, sit on, stand on, lay on, sit inside, chair on top, chair inside, chair and table on top of person, become a table. Space is inside the stomach. Exploring breathing. Expanding the stomach. Space within that and the lings. Expand contract. Take in breath, let go. Like an animatronic doll. Explore a space just using the back and the head. Turn handles, master manoeuvres, use just cheeks on the face. Minutiae movements. Unassuming. Quiet. Quite transfixing. Space around us (in the world) is shrinking. There are more boundaries, we are more restricted. We have a need for expansion and space. Something moving about small gestures. Vulnerability throughout the pieces. Which reminded Vlatka of a need to close down or break those boundaries. Within those boundaries – puts bodies in precarious positions. In between spaces, inside our minds. Exploring a border also engages your own body. Empathy with a space. An object, a texture. Kinaesthetic energies/ empathy with audiences? 1. Ways to test a space, with the body. 2. And the body being tested within a space. Layering – Gesture, Visual, Language. Group Improv – in/out, follow/mirror, own brain. It was time to go home, or in my case, my cousin’s, where I was staying over. I felt fine, head full, yes, but physically fine. Adrenalin probably, or a creative high. I got changed and made my way to Finsbury Park. Felt fine, felt fine, felt fine. Arrived at the house. Chatter, chatter, cup of tea, chatter, chatter. Could feel my body starting to crash. I needed to sleep. But I felt sick. Hunger? Ate a late tea. Still felt sick. Then it started. And lasted through the night. Poor cousin R – can’t be nice hearing someone throw up throughout the night. Had to admit defeat and phoned in sick on the Sunday morning; I was going to have to miss the second day of this wonderful workshop. Couldn’t even make notes and reflect. I was hot then cold. Hot then cold. Waves of sickness. Couldn’t stand up. The day came and went. The time for my train home was nearing. Couldn’t face a tube journey to the station, so treated myself to a taxi. Object, Space, Strategy, Witnessing, Participating, Shifting, Seen, Surmised, Speech, Silence, Meaning, Evidence, Informed, Loaded, Story, Redefined, Engage, Present, Touch, Smell, Hear, Move, Performative, Peculiarities, Guidance, Practical, Movement, Imaginative, Create, Frame, Approach, Distillation, Attention, Colourless, Interesting, Walking, Around, Centre, Mirroring, Parameters, Opportunities, Fight, Follow, Unison, Opposite, Collaborative, Decision, Group, Individual, Shifts, Dynamics, Invade, Pose, Disruption, System, Chaos, Cognisant, Rules, Agreement, Language, Economy, Variety, Limited, Palette, Freedom, Decision, Thoughts, Connections, Body, Cavity, Whole, Emptiness, Specific, Entire, Small, Slow, Pace, Shuffle, Crawl, Stand, Run, Danger, Graceful, Fold, Screw, Flat, High, Viewpoint, Finger, Foot, Leg, Arm, Head, Chin, Architecture, Line, Trace, Discover, Balance, Question, Interact, Surface, Explore, Test, Push, Share, Inquisitive, Prepare, Acrobatic, Agile, Manoeuvre, Outside, Inside, Unknown, Underneath, On Top, Beside, Inside, Become, Breath, Expand, Within, Minutiae, Unassuming, Quiet, Transfix, Shrinking, Vulnerability, Precarious, Position, Radicalise, Texture, Kinaesthetic, Energy, Empathy, Emerge, Process, Economy, Measure, Occupy, Layer, Gesture, Visual. I hope that I haven’t repeated any. Over the course of the next few weeks, I will attempt to reflect at a far deeper level; analyse, relate and consequently, consider how I can utilise. This might form the content of my next post, but it may not. There’s a mentoring session ahead of me, hovering on the horizon, which will require much preparation. That may need to take precedence. 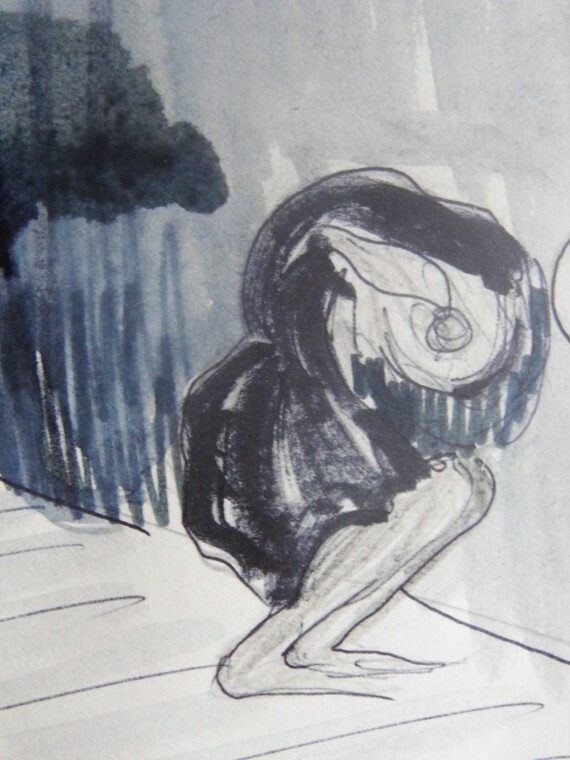 A week ago on the 2nd April (and slightly longer once I have posted this blog post) I was in London at Arts Admin Toynbee Studios for a weekender workshop with artist Vlatka Horvat. At this time (2.52pm), we were probably working on our solo performances, which were then to be shared with the group. I wasn’t feeling at my best. I admit to not being at the top of my game fitness wise, and if I am to be completely honest – I am very much at the bottom of my game; I am the most unfit that I have ever been. And here I was, in a room full of lithe people, some of who were professional performers, whose job it was to keep their body in tip top shape. I cannot use age as an excuse, as I wasn’t the oldest within the group (probably second oldest) and neither was I the only visual artist where physical fitness isn’t a necessity in order to succeed in the job. Our task was to devise a three minute piece based on all that we had learnt earlier in the day. We had 25 minutes to put this piece together. Throughout the day I had been wondering why I was struggling to climb the stairs in the Toynbee Studios building. Yes, there were a lot of stairs and we were up, down, up, down, up down as we either went to the loo, the kitchen or outside for lunch. Our studio was on the top floor (with a remarkable view, but more on that later) so there were a few flights to climb and a few corridors to navigate before you got to it. But, I was thinking, I am not this bad am I? I am not this unfit? I was racing an athletic 14 yr. old the other day at work (Fermynwoods Contemporary Art) and my studio at NN Contemporary Art is up two flights of stairs, with the kitchen and loo up another – so I am used to climbing stairs and sudden bursts of energy at work when I need to keep a teenage fidgety tree climbing, parkour enthusiast entertained when he needs to take a break from work. So why was I finding today so tricky? The more evenly paced group exercises I could handle, but at rest points I was fighting tiredness and hot and coldness and heart palpitations. I kept this all quiet, I was so lucky to be there, so wanting to be there, so I wasn’t going to let a weird body stop me. And also – the eldest of the group (?) looked like she was in considerable discomfort throughout the day with a crook back, so if she could keep going – so could I go! Before I tell you of my performance, and what happened next, I shall reflect on the morning activities. I was the first to arrive, straight from my train and tube journey – keen as mustard. Vlatka arrived and introduced herself. Someone else then arrived and with Mary from Arts Admin we all helped to organise the room for the day. As we did so, I marvelled at the view. The large square studio had full length mirrors down one wall and then one and a half of the walls had near floor to ceiling windows. The views out of these were wonderful. 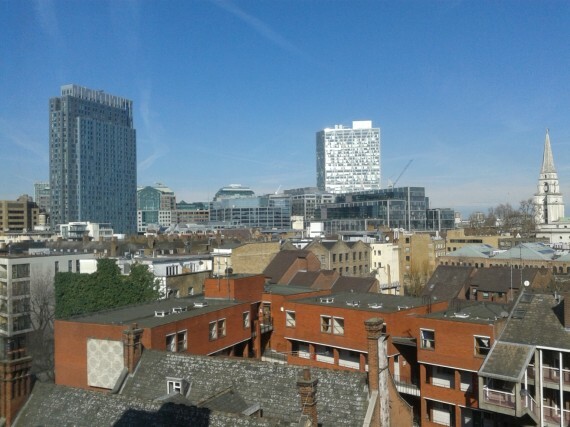 If you looked ahead and down you could observe the nearby tenants in the housing block as they went about their daily business; and then to the right you could gaze across Whitechapel towards Canary Wharf. The next seven hours were intense. Wonderful, insightful, thoughtful, active, collaborative and personal. I wrote 15 pages of notes in between all of the doing, discussing and dissecting. The day was made up of tasks, explorations, improvised group performances and those that were individual and self- directed. Our first task was to select an object that was in the room. There weren’t many objects – choices were limited to your personal belongings, coffee cups, chairs, tables or objects that had architectural functions i.e. door handles or safety notices. But this was the point. We were to devise a solo piece that centred on this object. Three minutes to describe it – what can be seen or surmised from it – not what we already know about. I selected my coffee cup. Knowing that you have just a few minutes to prepare for a performance focuses you to quickly sift through and select ideas; forming a construct – a frame, a style, a method of how you will perform. My comfort zone is to hang my performance around a narrative, a context that places and connects me to a place, space, or in this case a coffee cup. I gestured to the audience to stand away from me, in a semi – circle. My performance began with the cup, full of steaming coffee, centrally placed within the studio. I entered through the door and sat behind the cup, facing the audience. After describing the cup, I went on to mention that it was my cup of coffee and informed them of how much I had wanted that cup of coffee all morning and the situation that had led me to be sitting there with it. I then posed the audience a question – what would they do if they walked into an empty room and saw this cup of warm silky coffee just there, on its own, in the centre of the room. Would they wonder whose cup it was, who had left it there? Was it meant for them? Was it someone else’s? Did they want to drink it? Would they steal a sip? I continued posing these questions as I stood back up and retreated from the room, leaving the cup, on its own, still steaming from the hot coffee that was within it. Thrilled with a performance I was proud of, I then quietly re-entered the room and the next performer fluidly and gently took over. I was back in the audience, reflecting on my own performance while being beautifully led into being enraptured by the next. I cannot remember the order, but all the performances were sublime and rich for their own reasons. I didn’t know my fellow course members personally, but it was interesting to learn about them through their performances. The decisions we took as performers I think spoke volumes about our characters, what interests us and how we think. Researching Valtka’s work after the workshop, it was interesting to learn about how she works, what motivates her and how this informed the workshop and how she taught us. Perhaps more on that later. Distance to the objects, close or distance. How much access was the audience granted to the objects? Proximity does different things, delineates or makes you think about it. How different would it be to the audience if they were either witnessing or participating? Performances either had speech or were silent. If there was speech, there was either lots or small and gentle speech. Meaning – spaces are always completely loaded. No space or encountered object has no story. There is always a story. Evidence – the performances were informed by the evidence presented to the performer. Objects were redefined, within a space – playing with an object. Various ways to engage with an object, touch, smell, hear, move it. Various ways to present something – either the performer is the performer, using the object to illicit performance or the object can be a performance- the performer making the object perform. This assignment was to challenge us to thinking about object as performance; present an object that was the performer and the performer was the object. What does the space want? What could you do in there based on the peculiarities of the space? Ask for guidance from the space. How can you work with the space that you have been given? What does the space want? Can it be practical? Have movement? Presence? Be imaginative? How did people create a frame around a presentation? Is it an attempt to exhaust everything about that object or just focus on a particular thing about a thing (limited approach) or a distillation of parts? 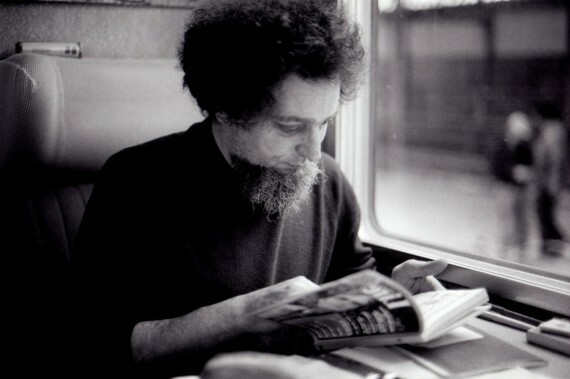 Vlatka then introduced the writer, filmmaker and documentalist (now called an ‘information specialist’) Georges Perec. As she described him, he seemed such a fascinating character. He was a member of the Oulipo Group a gathering of (mainly) French-speaking writers and mathematicians who sought to create works using constrained writing techniques. Perec was an insomniac who used to sit in coffee shops when he couldn’t sleep. Through this routine he became preoccupied with looking; making inventories of spaces. So, desks, then the room, the house, the street, the town…… He was very strict with how he looked at things. He endeavored never to describe the things that you know, always preferring to pay attention to the spaces that we usually fail to notice. One of his books is called ‘Species of Spaces and Other Pieces’ (in French the more eloquent sounding ‘Espèces d’espaces’) in which he documents these inventories using a combination of interviews, essay’s, fiction and puzzles. The pieces within this space (that is described as a book) span his writing career. Another book is titled ‘Void’. The original French title is ‘La Disparition’, which translates as ‘The Disappearance’. The Void is a 300 page book that on no page or in any word there exists the letter ‘E’ (except of course for the authors’ name) It is a novel written in a lipogrammatic style ( Lipogram is derived from an ancient Greek word which means ‘leaving out a letter’). The plot of the novel follows a group of ‘humans’ searching for a missing companion ‘Anton Vowl’ (get it?!) A key theme of the novel is absence. Both of Perec’s parents died in the 2nd World War, his father as a soldier and his mother in the holocaust. It has been suggested that the absence of the letter E in the book is a metaphor for Perec’s own sense of loss relating to these events and most notably, he is of course is unable to write the words ‘père’ or ‘mère’, ‘parents’ or ‘famille’. I had never heard of George Perec until the point of Vlatka mentioning him. I now have a clear and driven need to seek his books out, to fill a particular void of learning that his books will now fill. It was then time for some group work. 1. Walking within a space. Space A (large) and Space B (small). Walk around it, walk in the centre. a. In-front of curtains, lying on the floor, straight. Echoing the uniformity of the folds. b. Walk to the underneath of the blue lights, crouch down and curl up as if I was to be suddenly zapped by them. c. In-front of windows, perpendicular, arms up, echoing the line of the floor, upwards towards the window. 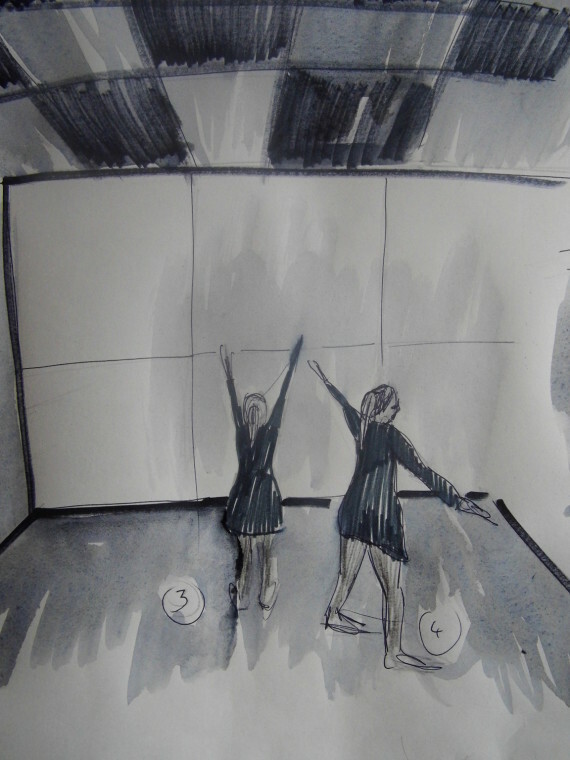 d. Move to the side, arms and legs spread, observing the square shapes in the floor and ceiling. 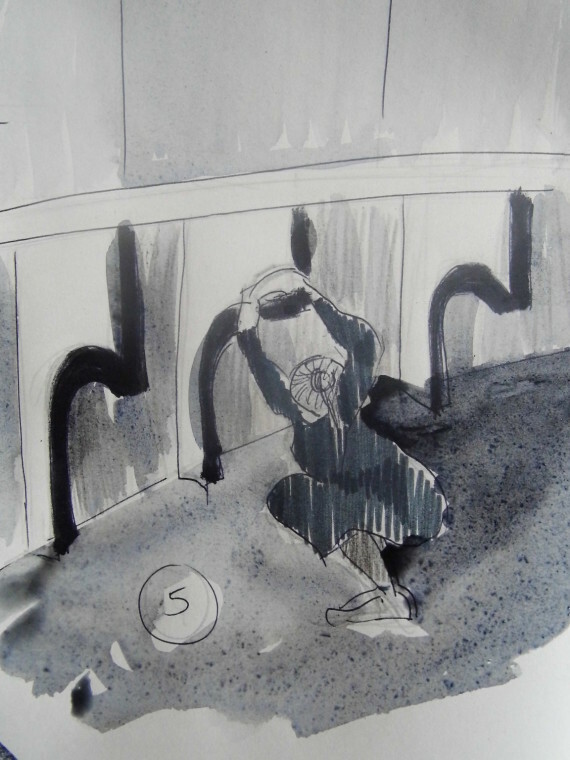 e. Walk to the practice bar, crouch down, twist my face to look inwards, curve arms to echo the shape of the iron supports. After we had practiced our own routine, we then embarked on a group piece, where we alternated between our own poses and those of others – where we mirrored theirs. I remember challenging myself as the ballet dancer (Neil?) was lifting himself up with one arm and leg next to the mirrored wall; I mirrored him, very close up, almost touching. And stayed there, and stayed and stayed and stayed. I was not going to move until he did! He eventually stood up, either through muscle tiredness or that he felt that it was the right time – that that particular mini performance within the whole had come to an end. What was nice was that later he then echoed the curvature of my arms against the iron supports. So I stayed. And stayed and stayed until I felt it was the right time to move. A beautiful unspoken exchange. As a group we moved and interacted in quiet, never instructing each other, always intuitive. It felt so natural. And it might sound slightly cheesy – but we were all at one, perfectly in tune to the performance as a whole and our individual parts within it. Vlatka watching – the only audience member. As a group – how do you mess with things, to change the parameters? Find good ways to be opportunistic. Still within the parameters of the rules, not doing anything that wasn’t allowed. Fight for space, follow, then have your own brain. Group can be in unison. But the other performers can do something that is the opposite. Sometimes moments of collaborative processes, sometimes individually decide to do something different. Different shifts in dynamics. A single disruption in a system of rules can work. Lots of disruptions would cause chaos. Everyone needs to cognisant and aware of what everyone else is doing – or it becomes a soup of disruption. If this happens, then one person needs to go back to the rules. Bring it back to the parameters or what was agreed. Language – working with economy of means. Variety and difference can come from a limited palette. Can always have the freedom to add your own rule – so do only mirroring – or do only 2 of your 5 moves. Shift between doing your own thing and working in the group. Little decisions you can make, not treating everything in the space equally i.e. I’m never going to go in the middle – or I am going to just follow this person. It was time for lunch picnic style outside. Felt a bit dazed.